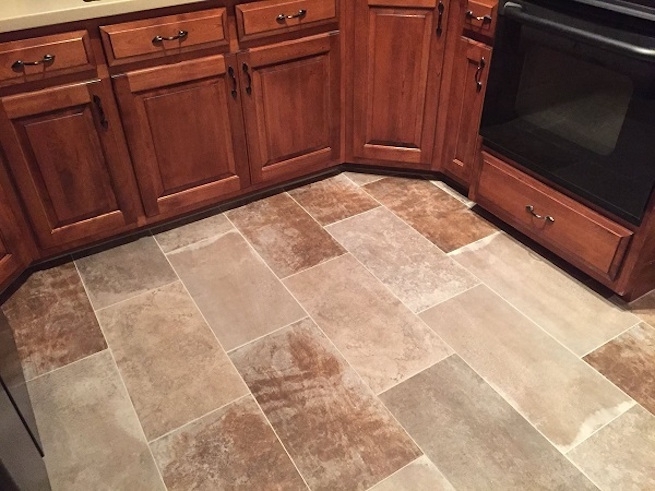 Porcelain tile can both color and style to your kitchen. Not only does porcelain tile come in a variety of colors and designs, but you can mix and match tiles to create unusual designs and patterns. Whether you’re installing tile flooring or creating a porcelain backsplash, don’t be afraid to get creative. When enhancing a kitchen with porcelain tile, Portland Oregon homeowners can use the following ideas to create a unique and customized design. Spice up the grid. The grid pattern is the easiest most common installation pattern for tile flooring and borders. A basic grid installation uses only square tiles of uniform size; however, there’s no need to stick to the basics. Spice up the grid pattern by alternating colors in checkerboard fashion or randomly interspersing different colors. Go for diamonds. A popular alternative to the grid pattern is the diamond pattern, which also uses square porcelain tiles but turns them at a diagonal. Although installing tile flooring in a diamond layout involves more cutting and requires about 20 percent more tile, Portland Oregon homeowners love the dynamic feel of this pattern. Lay some bricks. Another variation on the grid pattern, the brick pattern simulates the appearance of bricks by staggering the seams between tiles so that each seam lines up with the center of the tiles above and below it. Use rectangular porcelain tile to enhance the effect. Stripe it. If you have a modern kitchen and you want a modern porcelain tile backsplash, try adding a little stripe to your tile. Portland Oregon homeowners can vary both the color and height of the tiles when creating a striped pattern. For example, lay two or three rows of square tiles, followed by two or three rows of rectangular tiles that are wider than they are tall. These are just a few ideas for creating a customized porcelain tile installation. When installing tile flooring or backsplashes, you’re only limited by your creativity.